I immensely enjoy the writing of Garth Nix. I mean, I’ve read Sabriel and Timetwisters, so it stands to reason that I would likely really enjoy Newt’s Emerald. Plus, the description just really makes it sound like it is RIGHT UP MY ALLEY. Oh and the fact that this is kind of a super short book? I think the word we’re looking for here is SOLD. 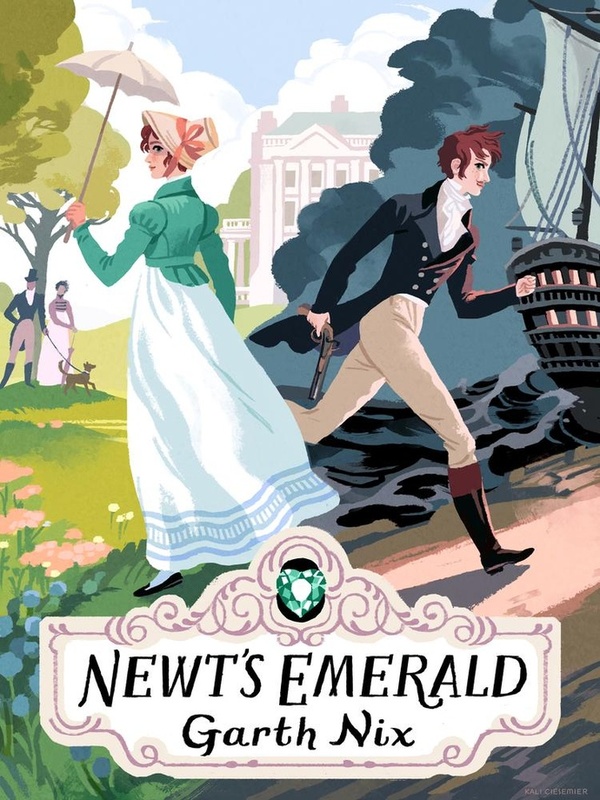 So, I picked out Newt’s Emerald to be one of the first books I’ve listened to via the library Overdrive app. Newt’s Emerald by Garth Nix is about a girl named Lady Truthful Newtington. Her cousin’s call her Newt and she’s definitely the title character in the story. Basically she’s already to make her debut in London (as many young women are in Regency era books). THEN, her magical emerald that controls the weather is stolen. Well, it would have been her emerald had she made her debut. So, Newt goes to London to get the emerald back, but in order to avoid suspicion, she dresses as a man. Along the way, Newt meets Major Harnett who helps her to get the emerald back but only because he thinks she’s Henri de Vienne. Of course, of course, Newt ends up catching feelings for the Major. Well, in all honesty, I don’t remember a whole ton of the book. I read it back in May 2016 and here I am writing the review in January 2017. I don’t know why I did not write the review sooner. Ultimately this book was merely okay for me. It didn’t spark a whole love storm of feelings or a hate whirlwind. I just liked it. I have no strong feelings one way or the other. Maybe I would have felt differently had I read a physical copy instead of the audiobook, but even then, I just do not know. The audiobook of Newt’s Emerald is narrated by Faye Adele. From what I remember, I did not dislike the audiobook narration. I do remember that the audiobook was mad short. However, I got through it very, very quickly. If you do end up going with the audiobook, maybe pay better attention to it than I did. Alas, this isn’t a terrible audiobook at all, just a sort of forgettable one. Yes, yes this book was that forgettable. I read this book a year or two ago. I felt the same way. I enjoyed it, but I didn’t have strong feelings about it either.